Add a cozy feel to your classroom with charming upholstered furniture! Sofa is covered in red or blue vinyl with a seat height especially sized for preschoolers (11"H). 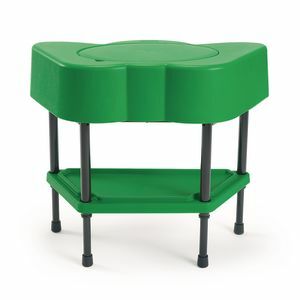 A must for a quiet reading corner or dramatic play area. Sofa measures: 33"L x 18"D x 21"H. Limited lifetime warranty. Assembled. Add a cozy feel to your classroom with charming upholstered furniture! Chair is covered in blue or red vinyl with a seat height especially sized for toddlers (8"H). 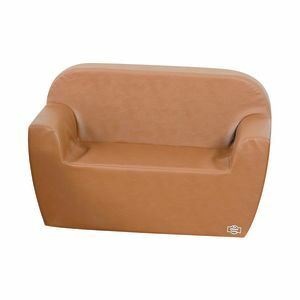 A must for a quiet reading corner or dramatic play area. Toddler chair measures: 20"x18"x18". Limited lifetime warranty. Assembled. Add a cozy feel to your classroom with charming upholstered furniture! 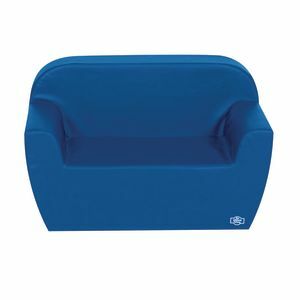 Sofa is covered in blue or red vinyl with a seat height especially sized for toddlers (7-1/2"H). A must for a quiet reading corner or dramatic play area. 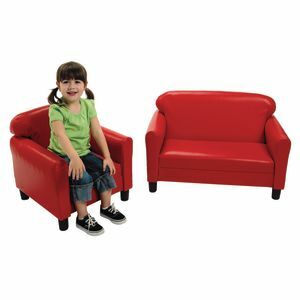 Toddler sofa measures: 33"L x 18"D x 18"H. Limited lifetime warranty. Assembled. Add a cozy feel to your classroom with charming upholstered furniture! Chair is covered in blue or red vinyl with a seat height especially sized for toddlers (7-1/2"H). 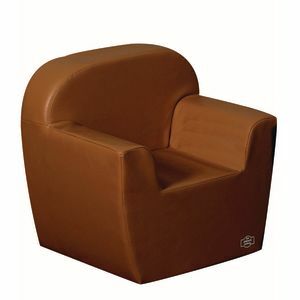 A must for a quiet reading corner or dramatic play area. Toddler chair measures: 20"x18"x18". Limited lifetime warranty. Assembled. Add a cozy feel to your classroom with charming upholstered furniture! 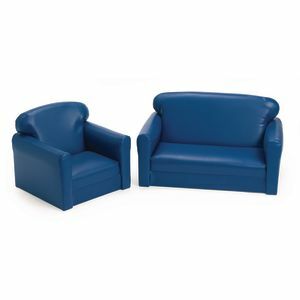 Sofa is covered in blue or red vinyl with a seat height especially sized for toddlers (8"H). 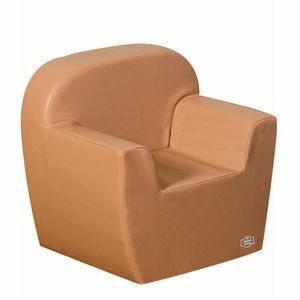 A must for a quiet reading corner or dramatic play area. 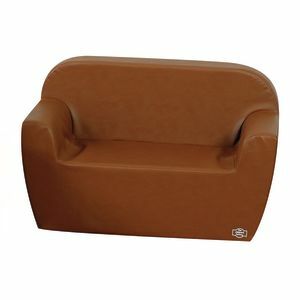 Toddler sofa measures: 33"L x 18"D x 18"H. Limited lifetime warranty. Assembled. Add a cozy feel to your classroom with charming upholstered furniture! 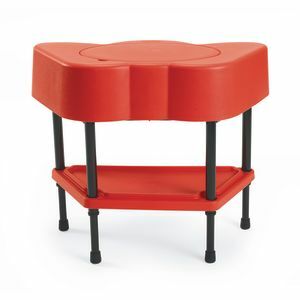 Chair covered in blue or red vinyl with a seat height especially sized for preschoolers (11"H). 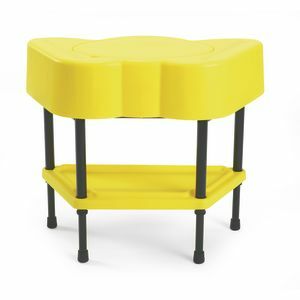 A must for a quiet reading corner or dramatic play area. Preschool chair measures: 20"L x 18"D x 21"H. Limited lifetime warranty. Assembled. Add a cozy feel to your classroom with charming upholstered furniture! 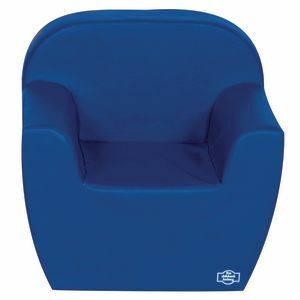 Chair covered in blue or red vinyl with a seat height especially sized for preschoolers (12"H). A must for a quiet reading corner or dramatic play area. 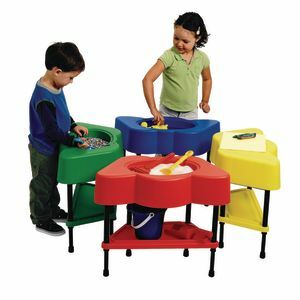 Preschool chair measures: 26"L x 18"D x 24"H. Limited lifetime warranty. Assembled. Clean lines and charm radiate from this cozy love seat. Clean lines and charm radiate from this cozy arm chair.